If you have ever received a bunch of gorgeous flowers from a partner or friend, you’ll know just how special fresh blooms can make you feel. The practice of hanami, or ‘flower viewing’, has long been celebrated in Japan, particularly surrounding the cherry tree blossom, or ‘sakura’. According to the Yamasa Institute, the practise of hanami was celebrated in Japan many years ago, with aristocrats writing poetry and singing under the trees and Japanese gathering underneath the blooms to eat and drink. Now, the blossoming of the cherry tree is an occasion that is celebrated across the globe. If you’re looking for a floral extravaganza, this mountain, located in the Nara Prefecture of Japan, is the place to go. The mountain is covered in more than 30,000 gorgeous cherry tree varieties, and is often considered the best place for viewing cherry blossoms. Visitors are able to hike the trails of the mountain underneath vibrant pink blooms, and even visit after dark for romantically illuminated cherry blossoms under lights. A festival and the lit up cherry trees are on during April, making it the best time to visit. A registered World Heritage Site, this mountain has more than just cherry blossoms to discover. According to the Japan National Tourism Organisation (JNTO), historical shrines, temples and areas adorn the mountain, including a site renowned with a military commander from the 12th Century, and known haiku poet Matsuo Basho. The United States capital celebrates the blooming of the cherry trees with the National Cherry Blossom Festival around April each year. However, celebrations depend on varying bloom dates, so if you’re looking to experience the best of the cherry bloom delights, it’s best to plan a longer stay. The mean date for blooming is April 4, but there is no guarantee that the pretty pink flowers will show themselves before or after this date. Because of this, the festival is planned according to the bloom of that particular year. Depending on weather conditions, the blooming period can last up to 14 days – so there’s plenty of time to view the delicate pink flora on full display. 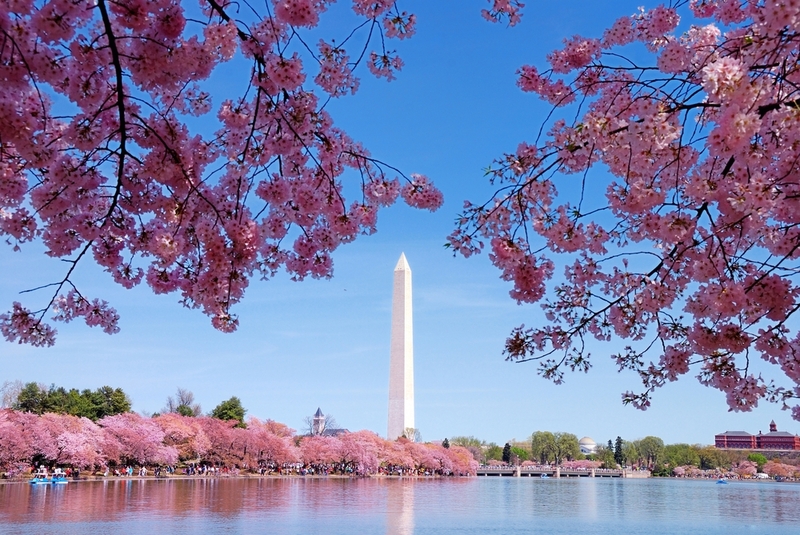 Currently, the blooming can be viewed at one of three National Park Service locations – in East Potomac Park (Hains Point), the Washington monument grounds, and the Tidal Basin in West Potomac Park. According to the festival’s official webpage, there are around 16 types of cherry tree on National Park service grounds today, totalling around 3,750 trees. The cherry trees were originally gifted to the United States by Japan in 1912, as a gesture of friendship. Today, the festival aims to recognise this gesture – and appreciate the stunning floral display, of course! The blossoming of the cherry tree is also celebrated locally, with the ‘Sakura-Matsuri Festival’ taking place at the Cowra Japanese Gardens in Cowra, located four hours from Sydney, each year. The event has been celebrated for 24 years, and involves plenty more activities than just cherry blossom viewing. In addition, guests can enjoy a traditional Japanese tea ceremony, watch martial arts experts and sumo wrestlers, and try their hand at calligraphy or the art of Ikebana, also known as Japanese flower arranging. This year, the festival will be celebrated on September 27, when the flowers are in peak bloom. However, the cherry trees continue to flower until mid October, so visitors are able to admire the blooms over a few weeks. Between mid April and early May, this beautiful festival will have visitors starry-eyed with the gently falling soft pink blooms of over 10,000 cherry trees. Highlights for families include a picturesque horse-drawn carriage ride underneath a canopy of candy-floss coloured flowers. The festival is located next to the Kitakami River, and visitors can also indulge in a scenic cruise along the riverfront.